Well it happened again! Another perfect KSL sale. A small Snapon roll around tool box. A guy called me, we talked for a bit, then he said he would take it at my asking price. Done deal. I even had it listed for $200 more than I was originally planning on listing it for. I also requested phone calls only. I didn't hear anything for about a week. Then this guy called and then bought it that afternoon. I really think that talking on the phone/in person is key to good classified sales. Stay away from texting, or call a person back that sends you a text. I bet you will have better luck. I think you're spot on @UNSTUCK. That's salesmanship 101. Verbal commitment. 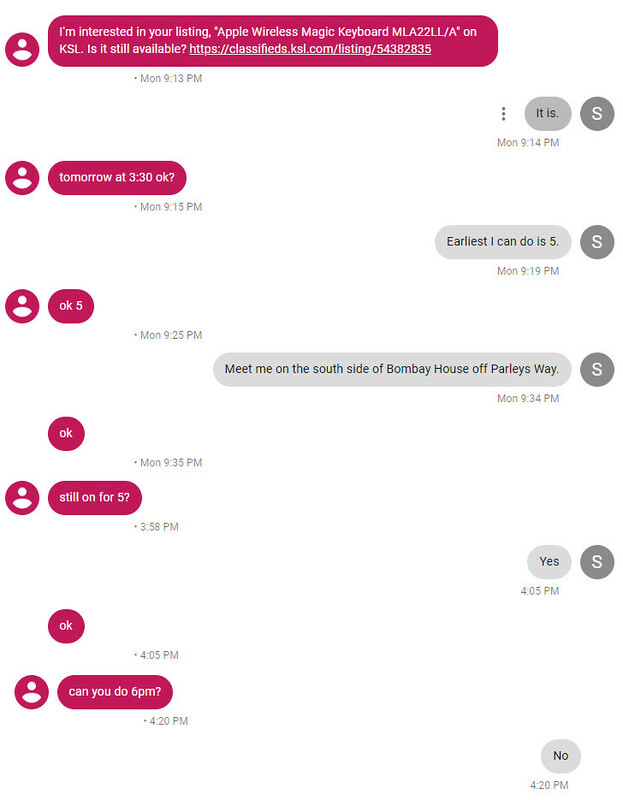 I show up at 5, wait around for 15 minutes, then give the guy a call. "Hi, Ty, this is Stephen with the Apple Keyboard. Just wondering when I can expect you." "Oh... Yeah, when you said that you couldn't meet at 6 I figured I just couldn't do it then." Rage building in me, "Yeah... that would have been nice to know since I've been sitting here waiting for you." What is wrong with people? Do we just need to nuke society from space? He took the saying "there is no such thing as dumb question" to the point we need to rephrase it I think. He hasn't replied and it's been hours... Wonder if he realizes how dumb the idea sounded. @Greg that guy pretty much asked to be your slave. You missed a great opportunity for indentured servitude. "Sure, you can have the truck you just need to give me a ride to and from work for a year. I'll chip in a few bucks a week for gas." I found this gem in my google voice account. I had forgotten it was there. I'm interested in your "2000 Toyota Echo" on KSL. Is it still available? I’m not trying to piss you off. But okay. reasonable offer 700$ I’ll do today ? I'm not mad, but refuse to play the typical KSL classified ad shopper game of "I haven't even looked at the car but will offer a lowball price". If you can find a more reliable car on KSL for less, I highly encourage you to buy it. So you are saying 700$ is low ball? me with that many miles. With that many miles. Sounds good. Best of luck in your car search. This thread is becoming a gold mine of black humor. "$6000 is a lot of BJ's"
I've offered to let people work off an item or make payments on it before... But I tell them I get to keep it until the contract is fulfilled.. They never seem to go for it.. I like this person already. A guy I work with played fantasy football with some guys from Boise. If he lost, he'd send a check with "for blow jobs" in the memo field hoping he wouldn't cash it. That never worked, he cashed them all. Haha... a guy I used to work with would say "planting tulips" (two lips). 6 grand would plant a lot of tulips. Back when people still used checks I used to write all kinds of crap like that in the memo field all the time. Never worked for me either. My in-laws were selling some barely used baby / kids stuff (a crib, kids bed) that they had in a guest room for occasions when their grandkids would come to town to visit. After the kids got a little older, they weren't being used anymore. They listed them on KSL. After a bunch of interest... but nobody showing up to actually pay for it... they received a text from a lady in provo who asked if she could just have it. LOL. My father-in-law said yes and that he just wanted it out of his house. Her reply... "can you also bring it to me"? A couple weeks ago, my wife was selling some nice leather boots that were worn a couple times. She said they were $90 so I would guess they were $150 in reality. She had them listed on Facebook for $35. A guy asked for pictures from every conceivable angle, which she sent him. he then offered her $20, she accepted. Then he asked if she could meet him, we asked where. He wanted to meet in Bountiful. We live in PG. I told him he could have them if he drove down to get them because it would cost me $20 in gas to meet him. He never replied. I got a text nearly immediately from a guy saying he wanted them I said great when do you want to come get them and he followed up with when could you meet me in South Salt Lake. That's when I took the ad down and threw it away.